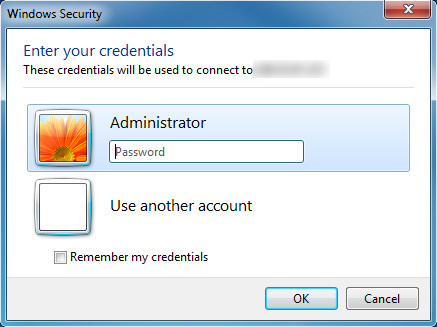 To connect from a Windows PC or another Windows server, you will require a Remote Desktop (RDP) program. 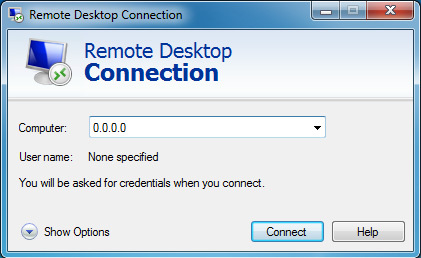 One of the best, and most common RDP clients is called Remote Desktop Connection (RDC), and is included with most versions of Windows. This is supplied in your "New Server Information" email, and can also be found in the Secure Client Area. You may see a message like the following. This happens because the security certificate used by your VPS is self-generated and self-signed. It's OK to connect because you know it's your own server, so feel free to select "Don't ask me again." Password: Password is supplied in your "New Server Information" email. You should now be connected to your server's desktop. Please take care to update your Administrator password right away! We also recommend the open-source application CoRD for OS X, which can be downloaded from here.The required login credentials will be the same as above. Search the Android Market or App Store for "RDP" and select an app. The required login credentials will be the same as above. If you require any assistance connecting to your VPS, please contact support. 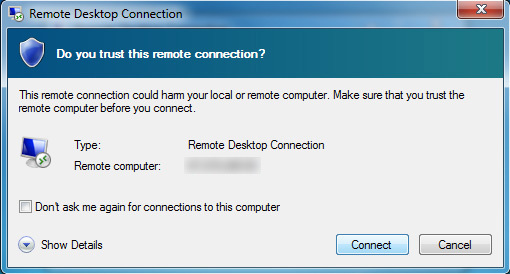 Remote desktop connection can't connect to the remote computer.